At Horse Power Healing Center, we believe anyone can learn to be around horses safely. Therapeutic Horseback Riding is all about taking into account each individual’s diagnosis, and teaching them to ride as independently as possible. We feel that independence starts with building a relationship with a horse. Just like building a friendship with a person, spending time with horses and getting to know each other’s likes and dislikes; communicating with horses is a lot of fun. Horses seem to have an innate ability to sense differences in people; their senses are very well-tuned. They know enough to change their pace if someone can not keep up, they know when to stand quietly, to help bring a sense of calm to one, and to wrap their neck around you when you need a hug. These are connections, and the experiences we hope all of our students will have. At Horse Power Healing Center we offer an Equine-Assisted Learning Lesson Program to serve many different populations and persons with diagnoses such as Traumatic Brain Injury, Stroke, Depression, Multiple Sclerosis, Cerebral Palsy, Downs Syndrome and all levels of the Autism spectrum. For individuals who are non-riders, HPHC also offers Un-mounted Lessons, where activities will include grooming, horse handling and horse care knowledge. 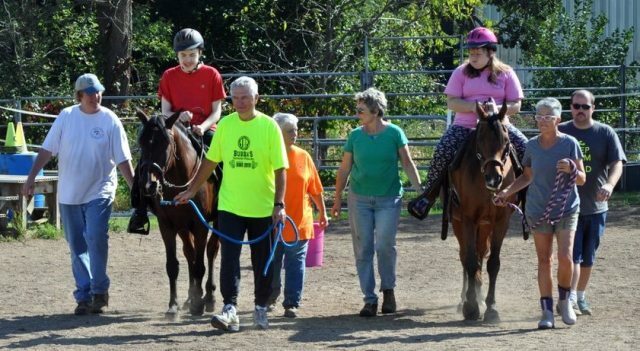 Another program offered is the "Horses for Hope" program for children and adults who are terminally ill. the "Horses for Hope" participants are able to visit the farm and meet the horses: if they are able they can also learn to ride a horse. through the intereaction with horses participants are empowered to be caregivers instead of care recipients. "Horses for Heroes" program offered by Horse Power Healing Center is affiliated with the national "Horses 4 Heroes" program and was created for the families of military personnel and Veterans, firefighters/EMTs, law enforcement officers, critical care and hospice nurses and special needs school teachers.